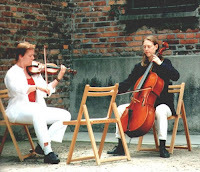 "Tupilak performance at Auschwitz concentration camp in Poland." BUCHAREST -- Succesful 1st stage of this year's ILGCN world rainbow cultural conference in the Romanian capital, May 22 (part of annual Gayfest). BUDAPEST -- The 2nd stage of the ILGCN world conference has been postponed since the dates for Budapest Pride have been moved back to August 30 - September 6. ST. PETERSBURG -- September 21 for the 3rd stage of the ILGCN conference 2009. (part of Russian Rainbow Cultural Festival). Visby -- Tupilak /ILGCN work will be presented at the Baltic Square solidarity event on this Swedish island between June 29 - August 4 during a major political/cultural week. Tupilak/ILGCN Travelling Art & Photo Exhibition, Photo Exhibit: "27 Prides in the EU"
Performances in the afternoon at Teater Tribunalen. (the biggest annual cultural event of the Nordic region) September 24-27. VILNIUS -- A European Parliament/ ILGCN rainbow cultural exhibition and seminars are planned for October in the Lithuanian capital -- this year the European Cultural Capital which so far has ignored rainbow contributions.